Combating climate change and boosting the economy are not mutually exclusive goals, the B.C. government said Wednesday while unveiling its new carbon reduction strategy. Some of the key features of the complex and ambitious CleanBC plan are requirements that every new building constructed in the province be "net-zero ready" by 2032, and that every new car sold in B.C. be a zero-emission vehicle by 2040. All the measures combined are intended to help the province meet its legislated climate target of reducing greenhouse gas emissions to 40 per cent of 2007 levels by 2030, but Premier John Horgan stressed they are not doing so at the expense of industry and jobs. "We want to make sure that British Columbia is a destination for investment and industry that wants to come here, that wants to lead the world with new technologies and new approaches to industry – that includes our traditional foundational industries like mining, forestry and natural gas," Horgan told reporters. The government will be offering incentives, paid for with carbon tax revenue, to companies with cleaner operations, and installing new transmission lines to help power large operations with clean energy. That includes natural gas production in the Peace region. B.C. has faced serious questions from environmentalists about how it will meet greenhouse gas reduction targets while still welcoming major investment in the liquefied natural gas industry, including the planned $40 billion LNG export terminal in Kitimat. 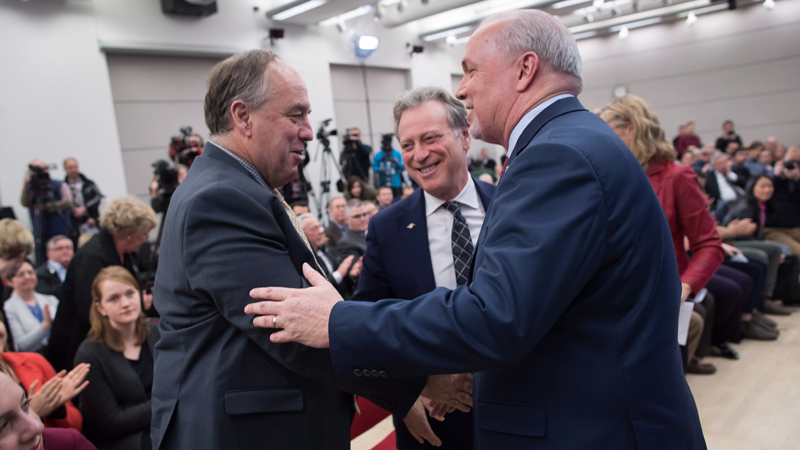 Under CleanBC, the province said it will limit emissions by encouraging "the use of the greenest technology available in the sector," and by powering production with electricity rather than the burning of fossil fuels. Part of the CleanBC strategy also includes a labour readiness plan designed to help people gain the skills necessary to work in a low-carbon economy. Green Party Leader and climate scientist Andrew Weaver applauded the measures as a way to find opportunity in the monumental challenge of addressing climate change. "This is not only a climate plan, this is an economic plan, and that's what's so exciting about what's being announced today," he said. "We welcome business here in B.C., but that business will be clean." Inaction is not an option, Environment Minister George Heyman said, referencing a recently released report that warns of catastrophic consequences if temperatures rise by just 0.9 degrees Celsius more. Even if that lofty goal can be accomplished, Heyman noted the impacts of warmer global temperatures are already being felt across the province. "We're seeing and living the effects of climate change, whether it's extreme weather, whether it's droughts, whether it's the two worst wildfire seasons in B.C. history back to back, these are all threats to our security, to our economy and to our health," Heyman told reporters. But the minister said the CleanBC plan is not about scaring people into action – quite the opposite. "I believe that people need to feel hope, not fear. And that's what we hope to bring today," Heyman said. Altogether, the government estimates it can reduce greenhouse gases by 18.9 megatonnes by 2030. Meeting its legislated target would require a reduction of 25.5 megatonnes from 2007 levels, according to the report. The costs associated with the plan are also unclear. The government said they would be outlined in the next provincial budget. Read the full CleanBC plan on the government website here.